What’s in a title? – CPA Theatricals, Inc.
Have you heard of FEELING ELECTRIC, AWAY WE GO or EAST SIDE STORY? Well how about NEXT TO NORMAL, OKLAHOMA! And WEST SIDE STORY? All of these musicals changed their title before the show got to Broadway. Why? Well for a number of reasons. Sometimes it takes a while for a musical to gel…to come together. Then, once it starts to come together, somehow a new title emerges. When that happens, the creatives and the producers chat and decide if the new title really expresses what the show is really about. Happens to the best of them, right? 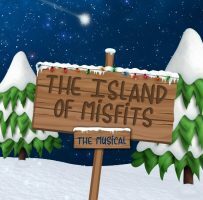 Well, with this blog, I am announcing that GRACE & THE ISLAND OF MISFITS is now THE ISLAND OF MISFITS – THE MUSICAL. Yep, a title change. How did that come about? Well, we had a full reading of the show last weekend in Milwaukee. Let me tell you about it. In collaboration with Carroll University, which has been very supportive of our work, we produced a concert style reading, with full music, of our Christmas musical. A packed house of family, friends, and nearby folks sat for 90 minutes and watched the show. And then (this is the point of a reading!) they gave us feedback about how to improve it. And, boy did we learn a lot. We used two ten year old children in the show as the toys. Our young man was Game Dude and our young woman was Puzzle Cube. First, we learned that the audience LOVED having children in the show – and they wanted more! So, for producers who want a large cast, they can fill it with children. We also learned that some of the music was in the wrong key for children. We also learned that we had just the right amount of music – not too much and not too little. Our show follows more of a Disney style, with most of the numbers in the beginning of the show. Then, as the plot gets going, it just flows quickly to the end. We learned that one of the numbers may not be necessary at all – even though the audience loved it – we may just cut the song. Our audience members also pointed out several inconsistencies in the show – oops – things we did not even see or catch. These are easy fixes, but that is why you do readings. We were thrilled that the audience seemed to agree with what we thought was our theme and affirmed that we were on the right track for much of our new journey. Ahhhh, that was good to hear. What’s in a title change? The start of a new journey. Oh, and you may never have heard of the musical OKLAHOMA. Really, you haven’t. Because they changed the title, at the last minute to OKLAHOMA!